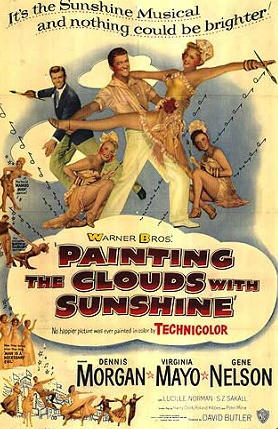 "Painting the Clouds with Sunshine"
This movie will be shown in a couple of days. It's not that well-known, but it's a pleasant way to spend a couple of hours. It stars four of the best musical talents from Warner Bros. and is very entertaining. The musical highlight for me is Gene Nelson and Virginia Mayo performing "The Birth of the Blues". If you are a fan of movie musicals, you just might like this. Thanks for mentioning this charming picture Terrence. I'd prefer to see something like PAINTING THE CLOUDS WITH SUNSHINE than a hundred airings of NORTH BY NORTHWEST. It has so much going for it! And of course, there's S.Z. Sakall and Dennis Morgan in the cast, too. Gene Nelson was such a great dancer. When he danced, he did defy gravity. I love your comment about Gene Nelson, Rayban. He's also extremely athletic. There is a number from "She's Working Her Way Through College" that takes place in a gym. I can't imagine any other dancer who could perform as he did in this number. He's truly amazing. I'm reading an Elvis bio ("Careless Love") which focuses on his post-army career. Right after "Viva Las Vegas" he did "Kissin' Cousins" and was thrilled when Gene Nelson was assigned to direct. 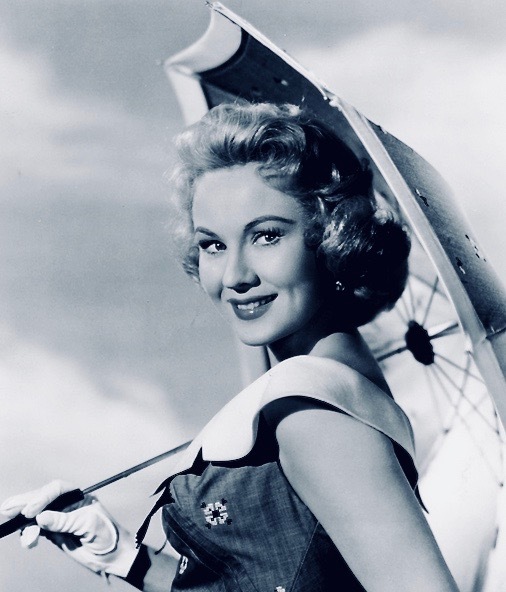 He apparently gushed to Nelson about his movies, particularly the ones with Virginia Mayo, and especially the gymnasium scene you mentioned. From that point on Elvis movies were done on the cheap, so neither Elvis nor Gene was really happy about the film, but Elvis still was impressed to be working with him. Terence, thanks, and didn't Gene Nelson initially start out as an ice skater? Rayban, I've never heard about Gene Nelson being an ice skater. But that certainly is believable. Yes, Gene Nelson began his career touring with the Sonja Henie Ice Show. Two of his early movies starred Doris Day. He had a few specialty numbers in 1950's Tea for Two and graduated to her leading man in 1951's Lullaby of Broadway. Of course, his biggest hit was singing and dancing to "Everything's Up to Date in Kansas City" in the movie version of Oklahoma! He was also terrific, as a straight dramatic actor, with Phyllis Kirk in Andre de Toth's "Crime Wave". Yes, he was. Wish he'd done more noir. Aired yesterday on TCM as part of the Virginia Mayo tribute. Hope people had a chance to see it!